The Theatre Royal Nottingham has announced some star names for its panto follow-up to a record-breaking production of Snow White and the Seven Dwarfs last Christmas. Leading the cast of this year’s spectacular panto is the nation’s favourite pantomime Dame, Christopher Biggins, in the role of Widow Twankey. Christopher has previously entertained pantomime audiences in Nottingham in Aladdin at the Theatre Royal in 2006. Christopher Biggins has enjoyed a hugely successful career in television, film and theatre. His countless TV appearances include being crowned King of the Jungle on ITV’s I’m a Celebrity, Get Me Out of Here!, winner of Celebrity Come Dine with Me on Channel 4 as well as making regular appearances on Ant and Dec’s Saturday Night Takeaway. He has established himself as one of the country’s most popular pantomime performers having honed his on-stage skills in pantomime throughout his career. Pop sensation Simon Webbe makes his pantomime debut in Nottingham in the title role of Aladdin. Simon is best known for being a member of the chart-topping boy band Blue. Between 2005 and 2009 the band took a break, which saw Simon launch his own solo albums and singles as well as writing songs. Simon’s career has also seen him take to the West End stage in Sister Act the Musical, alongside Shelia Hancock and Whoopi Goldberg. 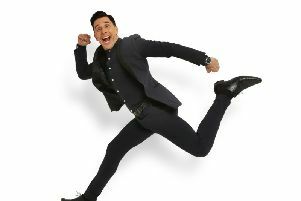 He has made numerous television appearances including Strictly Come Dancing where he was a runner-up in the 2014 series; has endured a stint in the Australian jungle in I’m a Celebrity, Get Me Out Of Here!, and has featured on ITV2’s The Big Reunion. Nottingham pantomime stalwart and funnyman Ben Nickless returns for his third consecutive pantomime at the Theatre Royal. Aladdin is staged by Qdos Entertainment, the world’s largest pantomime producer. Tickets can be booked on 0115 989 5555.